Joining in with Vic and the MPAY gang. Green is the word of the week. 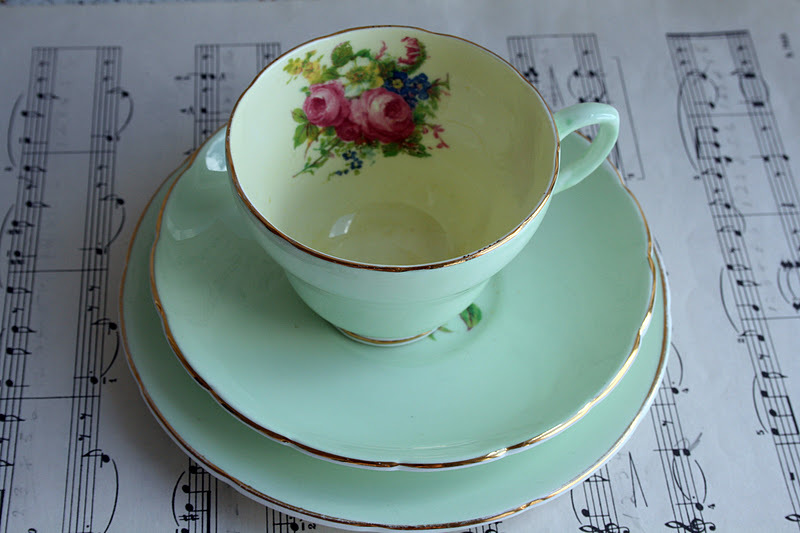 First up this little green cup and saucer set. Oh so precious to me. It belonged to my Nonna and was enjoyed by my Mum along with many other treasures after my Nonna died-a long time ago, I was just 13. 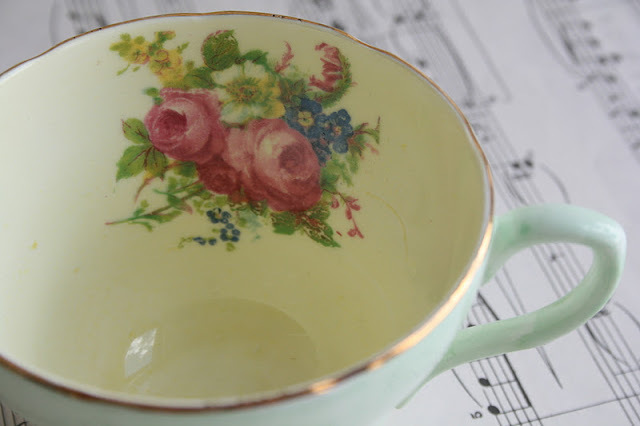 I had always loved that little teacup and saucer and often said so. For my 30th birthday my Mum finally gave it me. 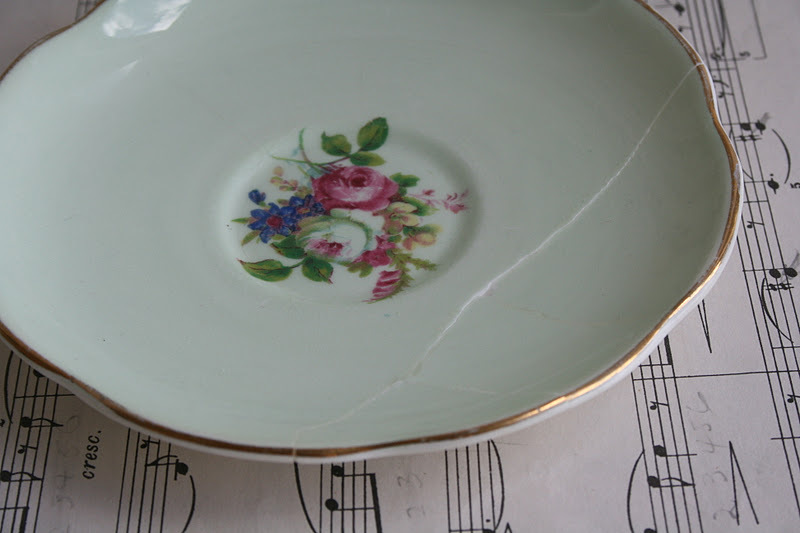 When I was cleaning, I accidently knocked it off it's home and the saucer broke. I was devastated. I phoned my Mum so upset and sorry I hadn't been more careful. She was disappointed as well but told me to gather up the pieces and Dad would fix it. She instructed me not to do it, not to let the Mr do it, but to bring it home to Dad because he (apparently) is really, super dooper cool at super glueing things back together. Who knew?! She assured me you would barely be able to tell. Apparently this skill has been lost at some point during his lifetime because his you beaut super glueing efforts were as dodgy as they come. The Mr and I still laugh about it to this day. Now here's the good bit. Last year when BF and I were visiting the Mill Markets I spotted this little lone saucer in the same design as my broken piece for just a few dollars. I was certain it was a match for my set. I could hardly believe my luck. Some 7 years later..to find a little lone saucer needing to be reunited with the set. 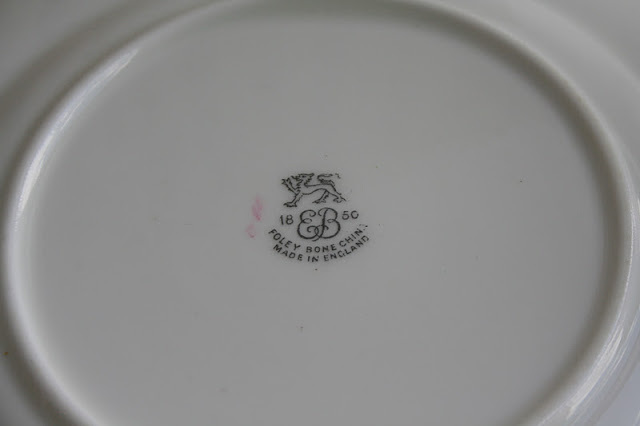 It is the same design and has the same stamp on the bank but the circle inside the saucer is ever so slighty larger than the original so I am thinking maybe it was for a coffee cup in the same set but I don't know.What do you think? Anywayyy big claps to you if you read that marathon story. And to wind it up...a few more bits of green collected from my craft space. Visit Punky and Me for more green fun! Your greens are gorgeous Lea and I love the story of the (beautiful) tea cup...how lovely that you found a matching saucer years later. Lovely story about your cup and saucer. I know exactly how you felt when the saucer broke same thing happened to some of my Nan's china but it wasn't me that broke it.Love your sewing bits and vintage sheets. Wow Lea you were so lucky to find another matching saucer! I love all your beautiful green goodies!!! What a lovely story Lea.... a little sad in the middle....with a beautiful ending. I know how you would have felt when it broke...I once got a gorgeous serving dish from my grandmother....it was all wrapped in newspaper and in a plastic bag. I put it on my bed .... intending to pop it up high in my wardrobe.....I then promptly forgot about it....until I went to go to bed that night....and threw it on the floor...smashing it to pieces. I have never gotten over that! Ive left you an award too....check my blog for details. Love all your pretty green pieces. You never know, you may find the exact saucer one day. All the green at Vic's makes me want to look out for it more, it's all so lovely. Oh. My. Goodness... I love it all! Thanks so much for joining in, so glad you did, what a lot of treasure. Amazing that you found a matching plate years later - wow! 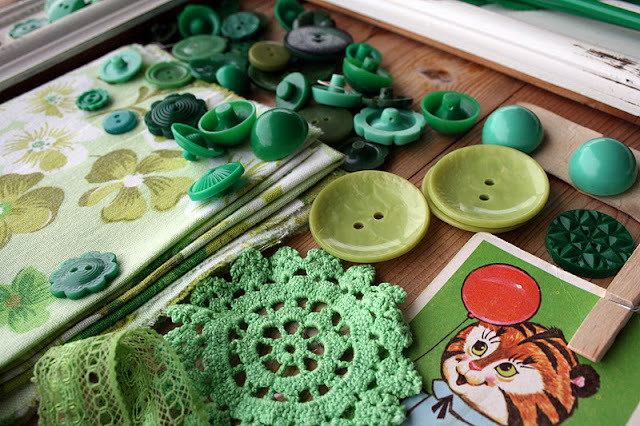 Love your green collection, especially the green doilies. I really liked your story about your nonna's cup and saucer. 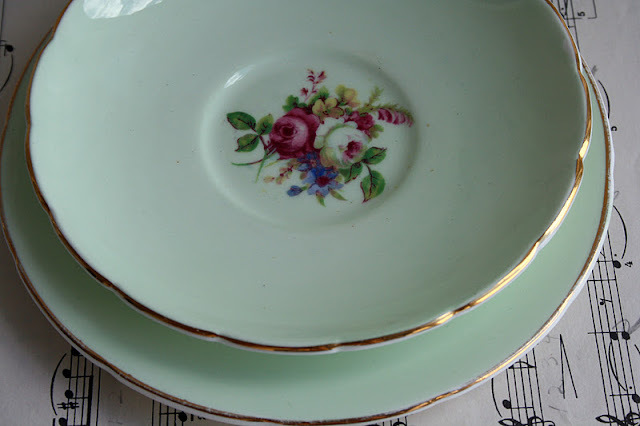 That's the best thing about antiques and vintage pieces - the stories they have. How lucky you were to find a matching saucer! what a great story! one of the many benefits of vintage... (i'll be sure to add this to my list as im currently justifying my op shop habit to the husband. haha)! LOVE all that green... easily my favourite colour! 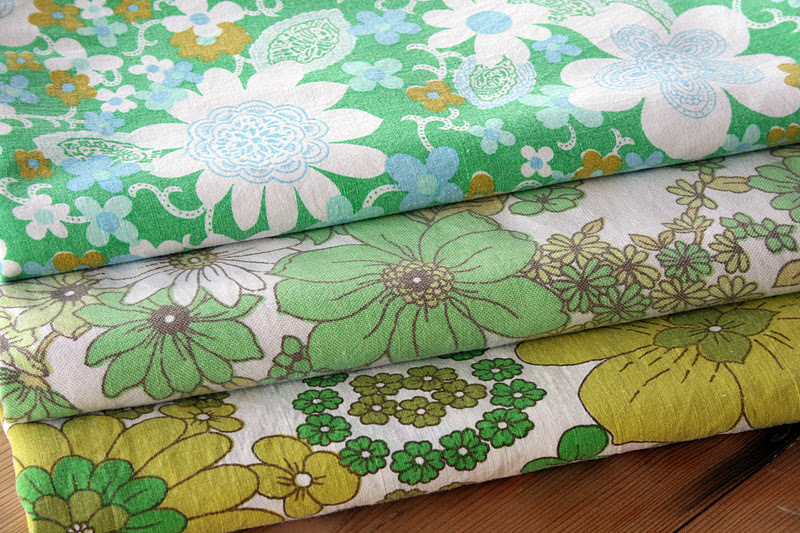 hope some of those sheets turn up in the swap... just gorgeous! How very fortunate to find the saucer Lea!. What a great story. I can imagine how you would have felt when it broke. I would have been devoed!.